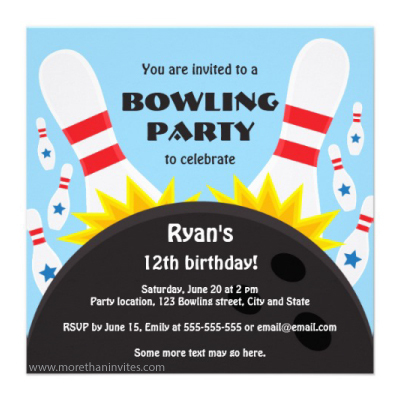 Birthday party invitation for kids featuring a bowling ball knocking down bowling pins. Blue background. Fun design, great for bowling themed parties. Coordinating products like stickers and stamps are also available. A customer who bought these invites gave a five star rating and wrote: Fantastic Invitation and Service! This was the first time I had used Zazzle and I couldn’t be happier! Fast service, great invitations and easy ordering. I will definitely be coming back. About the print: Great print work. I was impressed with how fast they arrived and still the quality of the product.